The New Year is one of the oldest festivals of the world, dating back to the pre historic era. The New Year History itself forms an extensive area of study. The history of New Year has undergone a series of changes over the ages to achieve its global form. The urge of celebrating New Year as a vibrant festivity emerged at the dawn of civilization. At present, New Year is celebrated on January 1 and it had been an essential part of the cultural and traditional practices of the different communities inhabiting the world. This had been the practice for the last few centuries but the New Year History had its root to yet far off times. Therefore, this is the principal reason that the New Year traditions vary from country to country. The earliest instance of New Year is found in Mesopotamian culture. It was about 2000 BC, when the people of Babylon used to observe New Year celebrations on the day of the Vernal Equinox that is during the middle of March. It was the Romans, who recognized March 1 as New Year Day in their calendar. At that time there were only ten calendar months beginning from March. The relevance of this fact can still be seen in the names of some months, which were been set according to their respective sequences in the calendar. As in the calendar of the present time the months from September to December are placed as the ninth, tenth, eleventh and twelfth months respectively, previously they were positioned as the seventh, eighth, ninth and the tenth months. In Latin, ‘Septem’ means, seven, ‘Octo’ means, eight, ‘Novem’ means, ninth and ‘Decem’ means ten. The Roman calendar also passed through an array of rectifications. The calendar was attributed with the months of January and February in 153 BC, by Numa Pontilius, the second Roman king. Thus the festival of New Year got shifted to the month of January for the first time, although people carried on observing New Year on March 1 for quite a long time after that. This is still not the end of the New Year History. Several new calendars were been devised. Julius Caesar implemented the Julian calendar which was created based on the solar system whereas the previous calendar were based on the lunar cycle. The Christianity has added up new meaning to the New Year Celebration by lionizing the Christmas Day, the Annunciation Day and The Easter as New Year Day at various times. 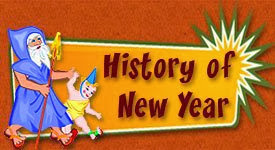 There had also been times when January 1 had been abolished to be celebrated as New Year altogether. It was in the Gregorian calendar established by Pope Gregory XII , New Year was firmly positioned on January 1. It was readily accepted by the Catholics and then by the Protestants and soon became a holiday recognized by the entire world slowly and steadily.